This lecture/performance series, sponsored by MAPP Construction Co., The Advocate, ATMOS Energy, Slim Harpo Music Awards and Pal Productions Co, places music educators and professionals in schools across the state of Louisiana. Music educators and professional musicians participating in the program include Deacon John Moore, Bobby Campo & Mike Esneault, Theresa Andersson, Herman Jackson, Buddy Flett, Andy Pizzo, and Johnny Palazzotto. Each brings his or her own unique style and personality and instrument, to the presentation. Students are invited to interact with the presenter and even participate in impromptu music lessons. 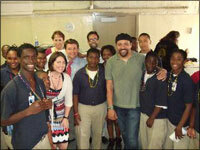 Check out these recent visits by the Music in Schools Program. Do you know a school that would be interested in participating in our Music in the Schools Program? There is no charge. For more information, contact us. Terrance Simien “Creole Music in the Schools” April 23, 2008 at Broadmoor Middle School. 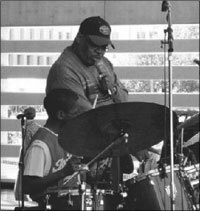 Herman Jackson works with an aspiring drummer at a Music in the Schools Program. Photo courtesy of Mike Lanza.